Being a mom is a tough job that not everyone can fulfill. Some mothers even prefer to abandon their young ones just to regain the life they previously have. But circumstances are different with Hanessy Billones Teodoro, a 22-year-old single mom. 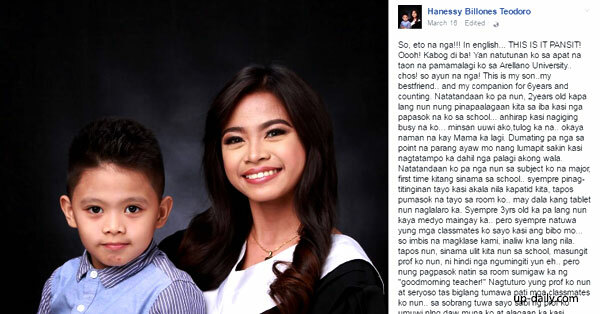 Hanessy shared her life-story as a student and single mother in a lengthy Facebook post, making her the newest internet sensation. Hanessy Billones Teodoro got pregnant at the age of 15. She was obliged to juggle motherhood and education in a very young age. According to her, there was a time when she was forced to leave her son to other people just to attend to her class. Sometimes, because of a busy schedule, her son got sulky as she has no time for him. Despite all those people saying that she won’t make it through, Hanessy was still determined to finish her studies. There were times when she was forced to bring her son to school and people were staring hastily at them. Hanessy also recalled the time when she left her child sleeping alone in their house because no one was there to take care of him. She waited long for the jeepney to arrive, but for 30 minutes, nothing showed up so she returned home only to see her son crying and looking for her. She did all of it for her son and her dreams to finish her education. As her graduation gets nearer, Hanessy will be so proud to receive her diploma after all those years of struggles. Even after so much struggle, Hanessy didn’t regret having her son in an early age. She loved him so much and offers her success to him. Her post touched the hearts of her readers, making it an instant viral story. The post currently have 7,000 shares and thousands of likes.